The CoDex is billed as “the go-to shoe when things get steep [and] can handle small edges and keep you on that steep roof.” I would agree the shoe performs admirably on those steep edges, driving power over the big toe. And with a $120 price tag, the CoDex delivers a lot of value. The low price however does have its tradeoffs and there are a few issues I think are worth noting. Below I’ll explain in detail what I like and don’t like about the CoDex and throw in a few comparisons to other shoes, along with sizing and fitting tips. Since the CoDex arrived in the mail (I received a free pair from Cypher in exchange for a review) I’ve been using this slipper all over North America, from sloping WA state basalt, to micro-edge limestone in El Potrero Chico, to the overhanging sandstone of Red River Gorge, and the occasional gym bouldering session. Powering through the crux at Frenchman’s Coulee in WA. I typically wear a 10.5 street shoe and I ordered size 10 in the CoDex. Too small. They have been an enormous pain to break in. During the first week of use, only when the temperature was above 70 degrees and the rubber was soft could I climb in them for more than a couple of moves. After an extensive break-in period, including wearing them in the shower and many other shenanigans, they actually stretched enough to wear even though the upper is primarily synthetic. I now find them quite comfortable despite being 1/2 size too small, and I routinely grab them for steep sport climbs. When fully weighted, my big toe causes the rand rubber to bulge out significantly beyond the edge of the sole, pushing my toe off of micro edges. I wish I ordered a 10.5. From my experience, I would recommend starting with your street shoe size and then dialing in the fit from there. Mike Bowsher over at Climberism also stated the CoDex fit true to his street shoe sizing. Too small! The rand rubber bulging beyond the edge of the sole on 12a in El Potrero Chico. I have a medium-low volume foot but with a wide forefoot which makes properly fitting any shoes challenging. The forefoot of the CoDex fits just a hair tight, what I’d expect from a shoe that’s 1/2 size too small, and I suspect that a properly sized shoe would fit my wide forefoot perfectly. Reinforcing my experience, Drew from Climbing Zine who has particularly narrow feet says he swims in the toe-box. Drew also wishes there was a second velcro strap to make up for this, where I find the single strap to be enough. 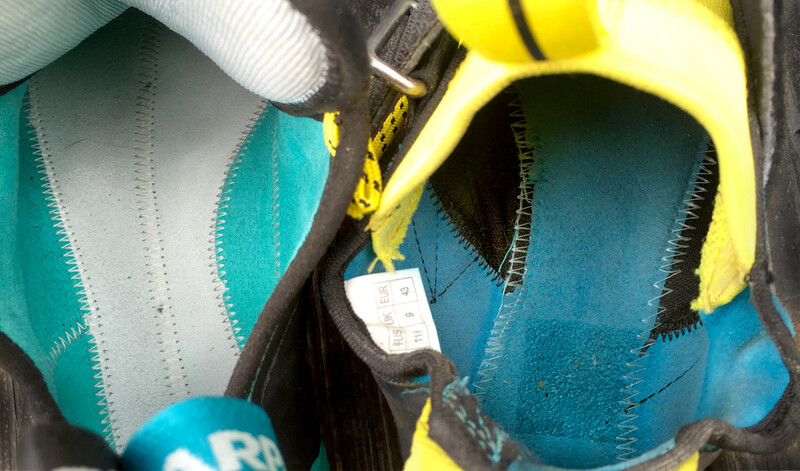 A little too much material in upper and a small dead space in the heel. Without using the velcro strap, the elastic tongue alone is not be enough to get a secure fit like I can with the Five Ten Moccasym. For my low volume foot, the CoDex has excessive upper material in the mid foot of the shoe. Despite this extra material, the CoDex is the most difficult shoe I have every tried to get on (the opposite of Andrew from OutdoorGearTV who says they’re easy to get on and off). Fortunately there is a large pull loop on the heel that allows me to get more than 1 finger in it to pull with everything I have. My heel is also low volume and I found there to be some pockets that I can’t quite fill out. It’s possible the dead space is a result of the shoe being too small, preventing my heel from slipping into the heel cup completely. Fortunately, even with the small air pockets in the heel I can still hook small features and I appreciate the sensitivity and stickiness of the XS Grip rubber. I have a major gripe with just about every climbing shoe I have ever tried on and the CoDex is no different: The material below the ankle is cut too high and it digs into my bony ankle. The CoDex employs a beefy 4.2mm thick full-length outsole made of Vibram XS Grip rubber. First released in 2007, the XS Grip is a wonderfully sticky compound which has been utilized for years on some of the highest performing shoes on the market. In addition to the CoDex, XS Grip is also used on Tenaya shoes including the Oasi and Tarifa. 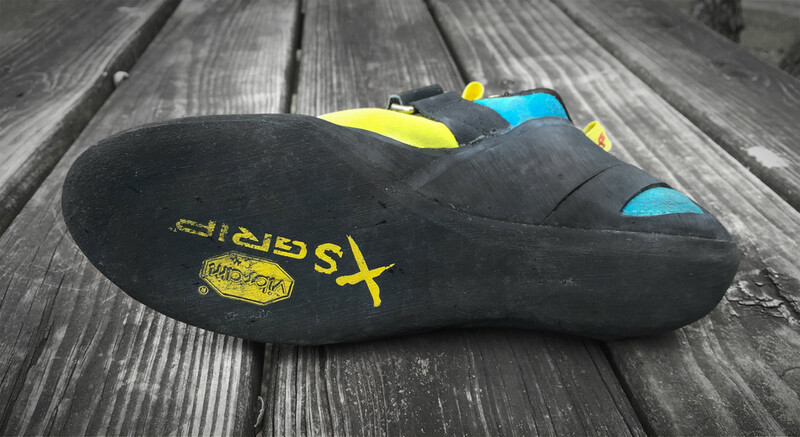 However, Vibram upgraded the compound and the newer XS Grip2 rubber is now used on the more popular high-end shoes including the La Sportiva Solution and Scarpa Furia. The original XS Grip is softer and is affected by temperature more so than the newer XS Grip2 compound. Personally, I wish they had chosen to use the Grip2 on the CoDex to improve overall edging performance and increase consistency. XS Grip sole rubber. Note: This is not the same as XS Grip2 rubber which is a little harder and performs more constantly in a wider range of temperatures. Although the 4.2mm thickness of the sole makes the shoe supportive and drives power to the toe, it also creates a lack of sensitivity when new, making it difficult to confidently and consistently stick small edges. But after the shoe is broken in and the sole becomes a little thinner the shoe becomes softer (particularly during warm weather) and a bit more sensitive, enabling more confident footwork. I noticed that the combination of the thick sole and soft XS Grip rubber made for an edging platform that would deform slightly on micro edges in vertical terrain when the temperature was above 80 degrees. This may be a result of my weight (I’m 169.75 lbs, unclothed) and lighter climbers may not experience the same issue. Other reviewers, including 190 lb. Ryan Hamilton from the Climbing Report, did not mention the same experience. Fortunately, this is less of an issue as the terrain gets steeper, which is precisely where the CoDex was designed to perform. Using a car analogy: You can think of the CoDex as the American muscle car of performance edging shoes. It’ll give you all the power you want for an affordable price, but don’t expect to get the precision Italian craftsmanship and refined performance of a Ferrari or Lamborghini. On the outside, the CoDex is a flashy shoe that draws attention with its bright acid green upper. But when you compare the interior of the shoe to that of the European competition the differences become more apparent. Where the Italian shoes in this category have beautifully tight stitching and clean edge banding, the CoDex is much less refined. Interior stitching. Left: an expensive Italian shoe. Right: The CoDex featuring less precision. The tradeoff for the low price is less refined craftsmanship than some more expensive shoes. But ultimately the question is, does the difference in craftsmanship impact performance or durability? Not in my experience. And given the CoDex is $30-$90 cheaper than most of the competition, it delivers value rarely seen in high performance climbing shoes these days. Most of the downturn in the CoDex occurs in the toe of the shoe, similar to the Evolv Shaman and Mad Rock Shark 2.0, which gives it the ability to pull on steep pockets. In addition to overhanging routes, the CoDex performs respectably on vertical pocketed limestone and sandstone. The toe of the shoe is slightly more blunt than some of the front-point specific shoes on the market making it more challenging to get into micro pockets, if that’s your thing. Despite the fact they weren’t specifically designed for it, Gif over at Rock Climber Life praised the CoDex’s ability to smear. Maybe it’s because I need go up a half size but I haven’t experienced an aptitude for smearing in this shoe. The thickness and stiffness of the sole combined with the downturned toe have kept me from feeling confident when the features disappear – I’ll be sticking to edges and pockets on steep terrain in the CoDex. I now routinely break out the CoDex for vertical to overhanging sport routes and find them quite comfortable considering they’re a half size too small. The combination of the single velcro strap and elastic tongue provides a secure fit and the cotton lining is comfortable against the skin. The slip-lasted CoDex utilizes an upper made of soft synthetic forward of the velcro strap and leather in the heel which seems to do the trick for my foot, keeping the shoe secure but comfortable. This value-based shoe would be great for heavier climbers who have trouble finding a downturned shoe that is supportive enough for technical edging. Similarly, this shoe will best fit folks with wide, large volume feet. If you’re looking to get into a pair of aggressive downturned shoes but don’t want to spent $170, the CoDex could be your ticket to entering this category. Start with your street-size if ordering blind. Normally we include links to retailers where you find the gear we review. Often these are affiliate links (if you buy the product after clicking the link, we get a small commission), but in this case we don’t have any of those. We’ll update this post when we know of more retailers that carry the CoDex, so you can more easily try it on and dial in the proper size. Although WeighMyRack received the CoDex for free from the distributer, we just got the shoes, no cash, checks, or promises of sponsorship. The expectation was that WeighMyRack would write an unbiased review, which you’ll find above. If you have any questions or comments about our review, the CoDex, or our life on the road, please feel free to ask them in the comments! Andreas is the other half of WeighMyRack. The half that films and edits all the WeighMyRack videos. And the half that usually does the dishes. And he's really good at making pizza.